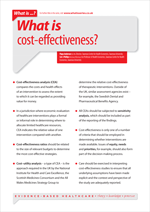 What is cost-effectiveness? | Whatis Series...? Cost–utility analysis – a type of CEA – is the approach required in the UK by the National Institute for Health and Care Excellence (NICE), the Scottish Medicines Consortium (SMC) and the All Wales Medicines Strategy Group (AWMSG) to determine the relative cost-effectiveness of therapeutic interventions. Outside of the UK, other assessment agencies exist – for example, the Swedish Dental and Pharmaceutical Benefits Agency.